December 3, 2018 — In December of each year, I look back over my articles for SoulTracks, my Twitter musings on new music, and the playlists of others whose tastes I respect to compile my “Best of the Year” selections for use in SoulTracks’ year-end features and playlists. Now that we're approaching the end of the year, I thought I would share them with SoulTrackers who may be jonesing for a new playlist. Those who regularly check this site will recognize some of the tracks, which I or other writers here have featured in First Listen articles or which have been included in the Fresh Soul playlist. 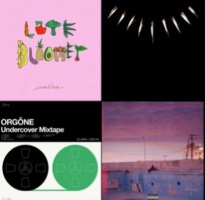 90 percent of the playlist is in the sweet spot of R&B/soul, with the balance from artists who brush up against that genre but are decidedly in another groove. My hope is that you’ll discover here some tracks that you may have missed or artists whom you don’t normally follow. Enjoy!